This article is about the World War II unit. For the American Civil War regiment, see Thomas' Legion. The idea of raising an armed force that would fight its way into India to bring down the British Raj goes back to the First World War, when the Ghadar Party and the nascent Indian Independence League formulated plans to initiate rebellion in the British Indian Army from Punjab to Hong Kong with German support. This plan failed after information leaked to British intelligence, but only after many attempts at mutiny, and a 1915 mutiny of Indian troops in Singapore. During World War II, all three of the major Axis Powers sought to support armed revolutionary activities in India, and aided the recruitment of a military force from Indian POWs captured while serving in the British Indian Army and Indian expatriates. The most famous and successful Indian force to fight with the Axis was the Indian National Army (INA) in southeast Asia, that came into being with the support of the Japanese Empire in April 1942. Fascist Italy also created the Azad Hindustan Battalion (Italian: Battaglione Azad Hindoustan) in February 1942. This unit was formed from Indian POWs from their Centro I POW camp, and Italians previously resident in India and Persia, and ultimately served under the Ragruppamento Centri Militari alongside units of Arabs and colonial Italians. However, the effort had little acceptance from the Indians in the unit, who did not wish to serve under Italian officers. After the Italian loss at the Second Battle of El Alamein, the Indians mutinied when told to fight in Libya. Consequently, the remnants of the battalion were disbanded in November 1942. Although the Indian National Congress (INC), the organisation leading the struggle for Indian independence, had passed resolutions conditionally supporting the fight against fascism, some Indian public opinion was more hostile toward Britain's unilateral decision to declare India a belligerent on the side of the Allies. Among the more rebellious Indian political leaders of the time was Subhas Chandra Bose, a former INC president, who was viewed as a potent enough threat by the British that he was arrested when the war started. Bose escaped from house arrest in India in January 1941 and made his way through Afghanistan to the Soviet Union, with some help from Germany's military intelligence, the Abwehr. Once he reached Moscow, he did not receive the expected Soviet support for his plans for a popular uprising in India, and the German ambassador in Moscow, Count von der Schulenberg, soon arranged for Bose to go to Berlin. He arrived at the beginning of April 1941, and he met with foreign minister Joachim von Ribbentrop and later Adolf Hitler. In Berlin, Bose set up the Free India Centre and Azad Hind Radio, which commenced broadcasting to Indians on shortwave frequencies, reaching tens of thousands of Indians who had the requisite receiver. Soon Bose's aim became to raise an army, which he imagined would march into India with German forces and trigger the downfall of the Raj. The first troops of the Indian Legion were recruited from Indian POWs captured at El Mekili, Libya during the battles for Tobruk. The German forces in the Western Desert selected a core group of 27 POWs as potential officers and they were flown to Berlin in May 1941, to be followed, after the Centro I experiment, by POWs being transferred from the Italian forces to Germany. The number of POWs transferred to Germany grew to about 10,000 who were eventually housed at Annaburg camp, where Bose first met with them. A first group of 300 volunteers from the POWs and Indians expatriates in Germany were sent to Frankenberg camp near Chemnitz, to train and convince arriving POWs to join the legion. As the numbers of POWs joining the legion swelled, the legion was moved to Königsbrück for further training. It was at Königsbrück that uniforms were first issued, in German feldgrau with the badge of the leaping tiger of Azad Hind. The formation of the Indian National Army was announced by the German Propaganda Ministry in January 1942. It did not, however, take oath until 26 August 1942, as the Legion Freies Indien of the German Army. By May 1943, the numbers had swelled, aided by the enlistment as volunteers of Indian expatriates. Overall, there were about 15,000 Indian POWs in Europe, primarily held in Germany by 1943. While some remained loyal to the King-Emperor and treated Bose and the Legion with contempt, most were at least somewhat sympathetic to Bose's cause. While approximately 2,000 became legionnaires, some others did not complete their training due to various reasons and circumstances. In total, the maximum size of the Legion was 4,500. Bose sought and obtained agreement from the German High Command for the rather remarkable terms by which the Legion would serve in German military. German soldiers would train the Indians in the strictest military discipline, in all branches of infantry in using weapons and motorised units, the same way a German formation was trained; the Indian legionnaires were not to be mixed with any German formations; they were not to be sent to any front other than in India for fighting against the British—but would be allowed to fight in self-defence at any other place; and nonetheless in all other respects the legionnaires would enjoy the same facilities and amenities regarding pay, clothing, food, leave, etc., as German soldiers. As for the unit's eventual deployments in the Netherlands and France, they were ostensibly for training purposes, according to Bose's plans for the unit to be trained in some aspects of coastal defence. After the invasion of France by the Allies, the unit was ordered back to Germany, so that it would not participate in fighting for German military interests. The British Indian Army organised regiments and units on the basis of religion and regional or caste identity. Bose sought to end this practice and build up one unified Indian identity among the men who would fight for independence. Consequently, the Indian Legion was organised as mixed units so that Muslims, Hindus and Sikhs all served side-by-side. Around the time of its formation in late 1942, 59% of the legion's men were Hindus, 25% were Muslims, 14% were Sikhs and 2% other religions. Relative to the British Indian Army, there were more Hindus and Sikhs, and fewer Muslims. 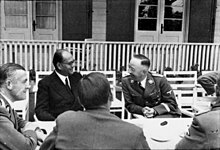 The success of Bose's idea of developing a unified national identity was evident when Heinrich Himmler proposed in late 1943 (after Bose's departure) that the Muslim soldiers of the I.R. 950 be recruited into the new Handschar Division. The commander of the SS Head Office, Gottlob Berger, was obliged to point out that while the Bosnians of the "Handschar" perceived themselves as people of a European identity, Indian Muslims perceived themselves as Indians. Hitler, however, showed little enthusiasm for the I.R. 950, at one stage insisting that their weapons be handed over to the newly created 18th SS Horst Wessel Division, exclaiming that "…the Indian Legion is a joke!" The uniform issued to the Indian Legion were the standard German Army uniform of feldgrau in winter and khaki in summer. Additionally, the troops wore on their right upper arm a specially designed arm badge in the shape of a shield with three horizontal stripes of saffron, white, and green and featuring a leaping tiger on the white middle band. The legend Freies Indien was inscribed in black featured on a white background above the tricolor. A saffron, white, and green transfer was also worn on the left side of their steel helmets, similar to the black, white, and red decal German soldiers wore on their helmets. Sikhs in the legion were permitted to wear a turban as dictated by their religion instead of the usual peaked field cap, of a colour appropriate to their uniform. The standard of the Indian Legion, presented as the unit's colours in late 1942 or early 1943, featured the same design as the arm badge previously issued to the men of the Legion. It consisted of saffron, white and green horizontal bands, from top to bottom, the white middle band was approximately three times the width of the coloured bands. The words "Azad" and "Hind" in white were inscribed over the saffron and green bands respectively, and over the white middle band was a leaping tiger. This is essentially the same design that the Azad Hind Government later adopted as their flag (although photographic evidence shows that the Indian National Army, at least during the Burma Campaign, used the Swaraj flag of the INC instead). In 1942, Bose instituted several medals and orders for service to Azad Hind. As was typical for German decorations, crossed swords were added when they were issued for action in combat. Nearly half of the soldiers of the legion received one of these decorations. It also included hospital, training, and maintenance staff. Adrian Weale has written that about 100 members of the Indian Legion were parachuted into eastern Persia in January 1942 tasked with infiltrating Baluchistan Province as Operation Bajadere. However, Adrian O'Sullivan has described such an operation as being "mythical" as it was logistically impossible and no documentary evidence demonstrates it took place. The legion was transferred to Zeeland in the Netherlands in April 1943 as part of the Atlantic Wall and later to France in September 1943, attached to the 344th Infantry Division and later the 159th Infantry Division of the Wehrmacht. From Beverloo in Belgium, the 1st Battalion was reassigned to Zandvoort in May 1943 where they stayed until relieved by the Georgian Legion in August. In September 1943, the battalion was deployed on the Atlantic coast of Bordeaux on the Bay of Biscay. The 2nd Battalion moved from Beverloo to the island of Texel in May 1943 and stayed there until relieved in September of that year. From here, it was deployed to Les Sables-d'Olonne in France. The 3rd Battalion remained at Oldebroek as Corps Reserve until the end of September 1943, where they gained a "wild and loathsome" reputation amongst the locals. The legion was stationed in the Lacanau (near Bordeaux) at the time of the Normandy landings, and remained there for up to two months after D-Day. On 8 August 1944 Himmler authorised its control to be transferred to the Waffen-SS, as was that of every other foreign volunteer unit of the German Army. The unit was renamed the Indische Freiwilligen Legion der Waffen-SS. Command of the legion was very shortly transferred from Lieutenant Colonel Kurt Krapp to Oberführer Heinz Bertling. The Indian personnel noticed a change of command was at hand and started to complain. Noting he wasn't "wanted" Bertling soon agreed to be relieved of command. On 15 August, the unit pulled out of Lacanau to make its way back to Germany. It was in the second leg of this journey, from Poitiers to Châteauroux that it suffered its first combat casualty (Lieutenant Ali Khan) while engaging French regular forces in the town of Dun. The unit also engaged with allied armour at Nuits-Saint-Georges while retreating across the Loire to Dijon. It was regularly harassed by the French Resistance, suffering two more casualties (Lieutenant Kalu Ram and Captain Mela Ram). The unit moved from Remiremont through Alsace to Camp Heuberg in Germany in the winter of 1944, where it stayed until March 1945. The 9th Company of the Legion (from the 2nd Battalion) also saw action in Italy. Having been deployed in the spring of 1944, it faced the British V Corps and the Polish II Corps before it was withdrawn from the front to be used in anti-partisan operations. It surrendered to the Allied forces in April 1945, still in Italy. With the defeat of the Third Reich imminent in May 1945, the remainder of the Indian Legion stationed in Germany sought sanctuary in neutral Switzerland. They undertook a desperate 2.6-kilometre (1.6 mi) march along the shores of Lake Constance, attempting to enter Switzerland via the alpine passes. This was, however, unsuccessful and the legion was captured by US and French forces and delivered to British and Indian forces in Europe. There is some evidence that some of these Indian troops were shot by French Moroccan troops in the town of Immenstadt after their capture, before they could be delivered to the British forces. The captured troops would later be shipped back to India, where a number would stand trial for treason. The integral association of the Free India Legion with Nazi Germany and the other Axis powers means its legacy is seen from two viewpoints, similarly to other nationalist movements that were aligned with Germany during the war, such as the Russian Vlasov movement. One viewpoint sees it as a collaborationist unit of the Third Reich; the other views it as the realisation of a liberation army to fight against the British Raj. Unlike the Indian National Army, conceived with the same doctrine, it has found little exposure since the end of the war even in independent India. This is because it was far removed from India, unlike Burma, and because the Legion was so much smaller than the INA and was not engaged in its originally conceived role. Bose's plans for the Legion, and even the INA, were too grandiose for their military capability and their fate was too strongly tied to that of the Axis powers. Looking at the legacy of Azad Hind, however, historians consider both movements' military and political actions (of which the Legion was one of the earliest elements, and an integral part of Bose's plans) and the indirect effect they had on the era's events. In German histories of the Second World War, the Legion is noted less than other foreign volunteer units. Filmmaker and author Merle Kröger, however, made the 2003 mystery novel Cut! about soldiers from the Legion in France. She said she found them an excellent topic for a mystery because scarcely any Germans had heard of the Indians who volunteered for the German Army. The only Indian film to mention the Legion is the 2011 Bollywood production Dear Friend Hitler, which portrays the Legion's attempted escape to Switzerland and its aftermath. In considering the history of the Free India Legion, the most controversial aspect is its integral link to the Nazi Germany, with a widespread perception that they were collaborators with Nazi Germany by the virtue of their uniform, oath and field of operation. The views of the founder and leader of the Azad Hind movement, Subhas Chandra Bose, were somewhat more nuanced than straightforward support for the Axis. During the 1930s Bose had organised and led protest marches against Japanese imperialism, and wrote an article attacking Japanese imperialism, although expressing admiration for other aspects of the Japanese regime. Bose's correspondence prior to 1939 also showed his deep disapproval of the racist practices and annulment of democratic institutions by the Nazis. He nonetheless expressed admiration for the authoritarian methods which he saw in Italy and Germany during the 1930s, and thought they could be used in building an independent India. Bose's view was not necessarily shared by the men of the Free India Legion, and they were not wholly party to Nazi ideology or in collaboration with the Nazi machinery. The Legion's volunteers were not merely motivated by the chance to escape imprisonment and earn money. Indeed, when the first POWs were brought to Annaburg and met with Subhas Chandra Bose, there was marked and open hostility towards him as a Nazi propaganda puppet. Once Bose's efforts and views had gained more sympathy, a persistent query among the POWs was 'How would the legionary stand in relation to the German soldier?'. The Indians were not prepared to simply fight for Germany's interests, after abandoning their oath to the King-Emperor. The Free India Centre—in charge of the legion after the departure of Bose—faced a number of grievances from legionaries. The foremost were that Bose had abandoned them left them entirely in German hands, and a perception that the Wehrmacht was now going to use them in the Western Front instead of sending them to fight for independence. The attitude of the Legion's soldiers was similar to that of the Italian Battaglione Azad Hindoustan, which had been of dubious loyalty to the Axis cause—it was disbanded after a mutiny. In one instance, immediately prior to the first deployment of the Legion in the Netherlands in April 1943, after the departure of the 1st Battalion from Königsbrück, two companies within the 2nd Battalion refused to move until convinced by Indian leaders. Even in Asia, where the Indian National Army was much larger and fought the British directly, Bose faced similar obstacles at first. All of this goes to show that many of the men never possessed loyalty to the Nazi cause or ideology; the motivation of the Legion's men was to fight for India's independence. The unit did allegedly participate in atrocities, especially in the Médoc region in July 1944, and in the region of Ruffec and the department of Indre during their retreat, and in addition, some elements of the unit undertook anti-partisan operations in Italy. However, in political terms Bose may have been successful, owing to events that occurred within India after the war. After the war, the soldiers and officers of the Free India Legion were brought as prisoners to India, where they were to be brought to trial in courts-martial along with Indians who were in the INA. Their stories were seen as so inflammatory that, fearing mass revolts and uprisings across the empire, the British government forbade the BBC from broadcasting about them after the war. Not much is known of any charges made against Free India Legion soldiers, but the Indian National Army trials that were initiated had the sentences they issued commuted or charges dropped, after widespread protest and several mutinies. As a condition of independence readily agreed to by the INC, members of the Free India Legion and INA were not allowed to serve in the post-independence Indian military, but they were all released before independence. Once the stories reached the public, there was a turnaround in perception of the Azad Hind movement from traitors and collaborators to patriots. Although the authorities expected to improve the morale of their troops by prosecuting the Azad Hind volunteers, they only contributed to the sentiment among many members of the military that they had been on the wrong side during the war. According to historian Michael Edwardes, the "INA and Free India Legion thus overshadowed the conference that was to lead to independence, held in the same Red Fort as the trials". Inspired to a large extent by the stories of the soldiers at trial, mutiny broke out in the Royal Indian Navy, and received widespread public support. While the troops who fought for the Allies were being demobilised, the Navy mutiny was followed up by smaller mutinies in the Royal Indian Air Force, and a mutiny in the Indian Army that was suppressed by force. In the aftermath of the mutinies, the weekly intelligence summary issued on 25 March 1946 admitted that the Indian military was no longer trustworthy, and for the Army, "only day to day estimates of steadiness could be made". The armed forces could not be relied upon to suppress unrest as they had been before, and drawing from experiences of the Free India Legion and INA, their actions could not be predicted from their oath to the King-Emperor. Reflecting on the factors that guided the British decision to relinquish their rule in India, Clement Attlee, then the British Prime Minister, cited as the most important reason the realisation that the Indian armed forces might not prop up the Raj. Although the British government had promised to grant dominion status to India at the end of the war, the views held by British officials after the war show that although militarily a failure the Indians who fought for the Axis likely accelerated Indian independence. ^ a b Müller 2009, p. 55. ^ Gupta, Amit K. (1997). "Defying Death: Nationalist Revolutionism in India, 1897–1938". Social Scientist. 25 (9/10): 3–27. doi:10.2307/3517678. ^ Fraser, Thomas G. (April 1977). "Germany and Indian Revolution, 1914–18". Journal of Contemporary History. 12 (2): 255–272. doi:10.1177/002200947701200203. ^ Douds, G.J. (2004). "The men who never were: Indian POWs in the Second World War". South Asia. 27: 183–216. doi:10.1080/1479027042000236634. ^ Lundari 1989, p. 90. ^ a b c d Littlejohn 1994, p. 127. ^ a b c d James 1997, p. 598. ^ "The Congress and the Freedom Movement: World War II and the Congress". AICC.org.in. Indian National Congress. Archived from the original on 7 May 2006. Retrieved 20 July 2006. ^ Kurowski 1997, p. 136. ^ James 1997, p. 555. ^ a b "Axis War Makes Easier Task of Indians. Chandra Bose's Berlin Speech". Syonan Sinbun. 26 January 1943. ^ Günther 2003, p. 24. ^ a b c Weale 1994, p. 213. ^ a b Davis 1994, pp. 21–22. ^ Copley, Anton (12 October 2012). "Reviews of Books: Subhas Chandra Bose in Nazi Germany: Politics, Intelligence and Propaganda 1941–43. By Romain Hayes". Journal of the Royal Asiatic Society. Third Series. 22 (3–4): 616–618. doi:10.1017/S1356186312000600. ^ Ganpuley 1959, p. 153. ^ Hartog 2001, p. 66. ^ Lepre 1997, p. 117. ^ Davis 1994, p. 42. ^ Littlejohn 1994, pp. 130–132. ^ a b c Davis 1994, p. 22. ^ a b Caballero Jurado 1983, p. 31. ^ Weale 1994, pp. 137–138. ^ O'Sullivan 2015, p. 171. ^ a b Houterman 1997, p. 63. ^ a b c Thomson, Mike (23 September 2004). "Hitler's Secret Indian Army". BBC News. BBC. ^ a b Munoz 2002. ^ "Subhas Chandra Bose: Er wollte Freiheit für Indien" (PDF). Augsburger Zeitung (in German). 19 August 2000. ^ a b c Goel, Urmila (2003). "Die indische Legion – Ein Stück Deutsche Geschichte". Südasien (in German) (4): 27–30. ^ Lebra 1971, pp. 190–191. ^ Sen, S. (1999). "Subhas Chandra Bose 1897–1945". Andaman Association. Archived from the original on 5 March 2005. ^ a b Toye 1959, p. 63. ^ a b c James 1997, p. 553. ^ Lormier 1998, pp. 35–36. ^ "Le passage des Hindous dans le département de l'Indre (fin août 1944)" (in French). French official public archives, presented and annotated by Jean-Louis Laubry. Archived from the original on 3 April 2012. ^ a b Edwardes 1964, p. 93. ^ Günther 2003, pp. 112–113. ^ James 1997, pp. 571, 598. ^ Bhat, Dhanjaya (12 February 2006). "Which phase of our freedom struggle won for us Independence?". The Tribune. Retrieved 17 July 2006. ^ Brown 1999, pp. 328–330. ^ James 1997, p. 557. Günther, Luther (2003). Von Indien nach Annaburg: Indische Legion und Kriegsfegangene in Deutschland (in German). Berlin: verlag am park. ISBN 3-89793-065-X. Lormier, Dominique (1998). La poche du Médoc (in French). Montreuil-Bellay: Éditions CMD. ISBN 2909826716. Lundari, G. (1989). I Paracadutisti Italiani 1937/45 (in Italian). Milan: Editrice Militare Italiana. Müller, Rolf-Dieter (2009). "Afghanistan als militärisches Ziel deutscher Außenpolitik im Zeitalter der Weltkriege". In Chiari, Bernhard (ed.). Wegweiser zur Geschichte Afghanistans. Paderborn: Auftrag des MGFA. ISBN 978-3-506-76761-5. Wikimedia Commons has media related to Legion "Freies Indien". This page was last edited on 12 January 2019, at 21:51 (UTC).